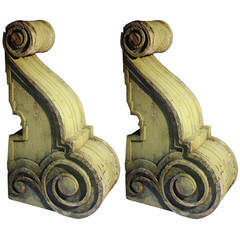 Set of size large 18th-19th century stone corbels, available to purchase in pairs. Designed for use as an architectural element, however the corbels show no signs of being used for this purpose in their lifetime. The corbels have a label with the name of renowned Mayfair gallery ‘David Aaron’. Placed upside down they make a great table base, two for a console table, four for a desk/small table and all six for a large dining table. Glass top not included. Measures: Height 70cm x width 34cm x depth 15cm. Early 19th century large estate tree guard. Measurement approximate height 169cm x diameter 119cm. Large late 19th century French locksmiths trade sign, in the form of a key. Measures: Height 125 cm x width 106 cm x depth 5 cm. 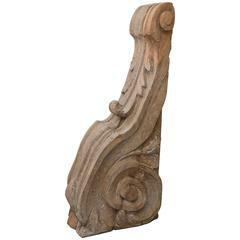 Large French carved corbel with acanthus leaf in oak. 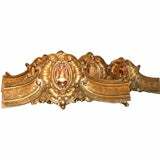 Set of four 18th century French giltwood corbels / brackets.